A New Mac Tip Every Day: A workaround for another bug in the dictionary! 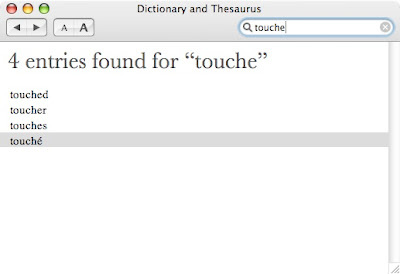 But, if you enter "touche" without any accent, the word "touché" with an accent pops up in the search results. After searching using many different combinations, I found that the best way is to simply enter the equivalent non-accented character. 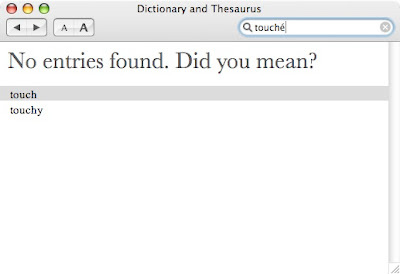 I can't seem to find a Thesaurus in Mac. Where to look please? first of all thanks for the great tips you post here daily. Keep up the good work. The bug you're referring to probably has to do with the language setting when the word was input in the dictionary. I have come to this realization accidentally myself when doing searches in different languages. Although some letters/characters are universal, they are treated differently. So if touchè was typed using French layout, it wouldn't be found when typing in US or UK or any other! The dictionary is actually both, see my screenshot. Just click on either dictionary or thesaurus. Opening a playlist in a new window!